Re-enforcements have arrived on the battlefield to help Wolverine and his X-men battle the almost unstoppable Exodus. Wolverine at first is reluctant to use the assistance who happens to be the young X-men from Utopia. With no other choice Wolverine and the assembled heroes band together and manage to defeat the villain. The Young X-men then take him back to Utopia to be jailed since the school can’t. Back at the school Wolverine has harsh words with Rogue about trust and Rachel believes Rogue may have contacted Utopia to see her new lover Magneto even if she doesn’t realize it. The students meanwhile are told by precog Blindfold that the worst is yet to come. 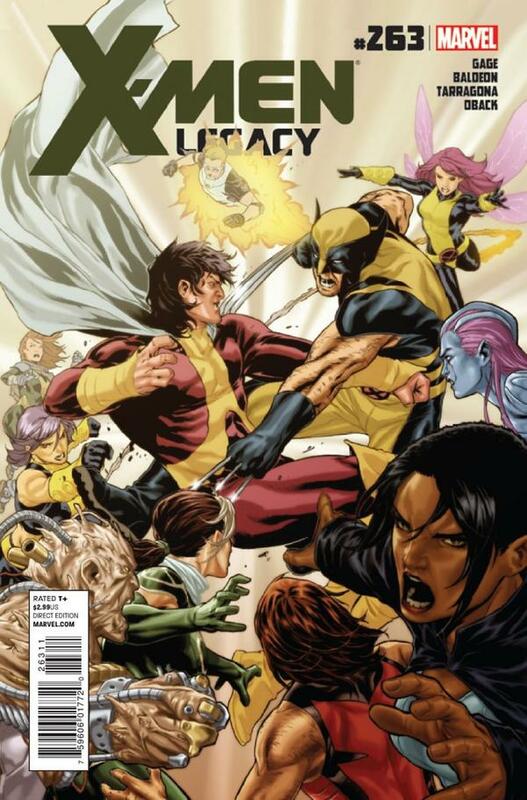 Cover-Wolverine’s X-men team and Cyclops protégé’s of the Young X-men banding together to face Exodus. Nice clean line work and colors, good looking cover! Ethics- What ought to be done? 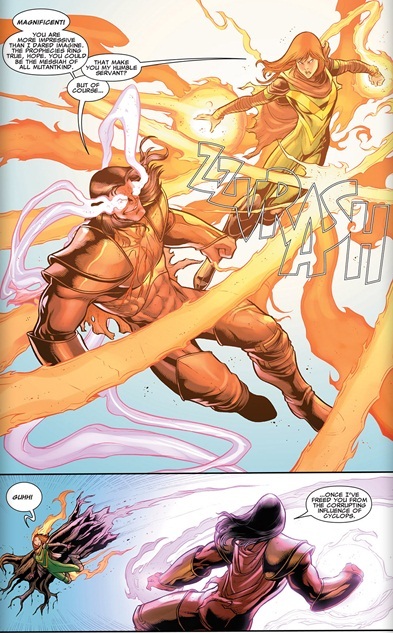 Let’s look back on schism, Idie Okonkwo killed some mutant haters in defense of the x-men. Wolverine realized that the X-men had become an army and the children, child soldiers. He disproved and decided it was time to create an alternate solution to save the kids from literally becoming like him. Those who also had doubts about Cyclops methods left with him. Rogue left because most of the children were going to be with Wolverine and that’s where her teaching skills honed under Cyclops leadership would be best put to use. In the present the children who they thought to liberate from the life of being a “soldier” have literally saved their lives. Said kids also point out the lunacy of the school and even attendance there. The last time some of these students were at this school a whole bus of them were slaughtered like cattle. Since then everyday has been a fight for survival. What’s the point of pretending they are normal kids with bright futures when they aren’t? why delude themselves? Which is better, delusions or reality? Wolverine vs Rogue– Tensions mounting since Legacy 262 reach a breaking point this issue. 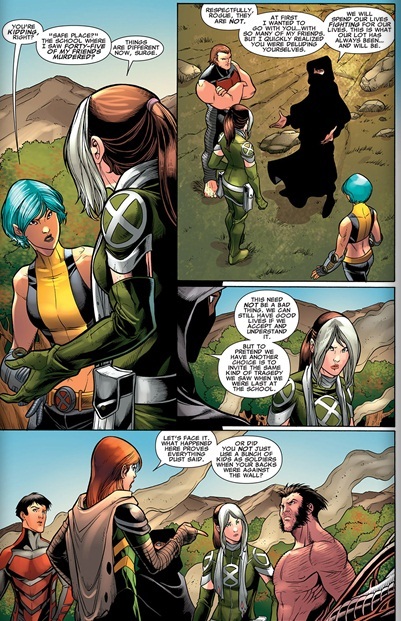 Rogue has stepped over the line and gone behind Wolverine’s back to send a distress call to Utopia. That distress call wasn’t intercepted by the veteran X-men but by the very children who remained on Utopia that Wolverine and Rogue are trying to shield from a “dangerous lifestyle”. Wolverine is very upset with Rogue despite the fact that Rogue’s “call for help” literally saved their lives. Back at the school Rogue’s practical approach to the situations leaves her more popular among the staff and students while Wolverine’s hard handed approach lands him on the “Prick list”. Wolverine’s main rival for the rank of leader and headmaster at his school is Rogue just as Rogue’s problem for leadership while she lead the X-men was him. Wolverine goes so far to say that he now knows Rogue is not on his side despite being at the school, he will deal with her accordingly. Fun times ahead BH fans! Art- David Baldeon turns in some great art as usual, it seems every issue things getter better, kudos David! Story– Frenzy was background this issue but allot of tension has come to the fore. Personalities from Rogue, Wolverine and Exodus were front and center. Let’s see where things go from here! ← Six New Avengers Posters Assemble!